When a Check Engine light is illuminated, this means the onboard computer system in your vehicle has detected a problem or service need with one or more of the many different systems it monitors and controls, such as your engine or transmission. Therefore, Milex recommends our Computer Diagnostics service to provide you with an accurate assessment of your vehicle’s condition. Our Computer Diagnostics service utilizes state-of-the-art diagnostics equipment, which is connected to your vehicle to view any computer trouble codes. 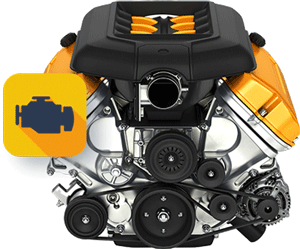 To have your Check Engine light diagnosed, find your nearest Milex to consult a professional. A technician connects a scan tool to your car’s on-board diagnostic system to determine the problem. Further diagnostics may be required to pinpoint the exact cause of the problem.